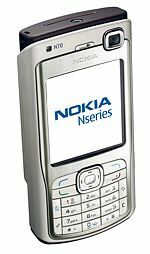 Nokia N70 is a Nokia Nseries multimedia 3G smartphone that features tri-band support (GSM 900/1800/1900 MHz), GPRS, WCDMA and EDGE (EGPRS) support, 220MHz ARM9 processor, larger amount of System RAM, 262 144 colours 176×208 pixels TFT Matrix LCD screen, 2 megapixel camera with built-in flash (photo light) and 20x digital zoom, a 0.3 megapixel front camera with 2x digital zoom to allow video calling, FM radio, Bluetooth 2.0, digital music player functionality, 3D Java games support, video recording and playing, RS-MMC memory card slot, Internet browser, and speakerphone. Ubergizmo (dead link) reviews Nokia N70 after using it for a few months and concludes that it’s not perfect, but it’s pretty damn good. The Nokia N70 is definitely a high-end, stylish phone. The N70 is most capable for fast data access and low-intensity email and texting. Imaging features are above most phones. I would define the N70 as a smart (imaging) phone trapped in the shell of a candy bar cellphone: the inside is more powerful than what its body can handle. Mobile-Review concludes that the Nokia N70 is at a high level considering the reception that is typical of the Nokia smartphones. The signal is loud and hard to miss in a noisy street; one of the following file formats can be used for a call signal: MIDI (64-tones polyphony), AMR (NB-AMR), True Tones (WB-AMR), WAV, MP3, AAC, eAAC+. The vibracall is average in power. Now the Nokia N70 is the best smartphone without a touchscreen, no direct rivals. Only the HTC Typhoon can act as indirect rival (and new models that are to launch this summer), it is smaller, lighter, with longer battery life, but having a weaker radio-component and Bluetooth is worse realized. Direct comparison is incorrect since the devices are based on different platforms. infoSync World concludes with 3G phones score of 75% and business phones score of 60% and concludes that despite being an otherwise excellent handset, the Nokia N70 struggles to measure up as a business phone mainly as a result of its inability to properly work with documents – for which its keypad and medium resolution screen are to blame. Poor synchronization capabilities further worsen matters, yet there is no denying that the N70 hosts excellent document viewing software, as well as rock-solid connectivity, good battery life, the ability to easily expand memory and a 2 Megapixel camera which delivers impressive results. Add an adequate browser, and you have yourself a decent 3G phone.